MacKenzie and Manuel Chavez III of Hyde Park were recognized at the ProKids Soiree for their passion and their generosity, their insight and their leadership, which have brought so many committed people to ProKids – leading the organization to serve even more children. ProKids President Emeritus Jeb Head presented the Community Builder of the Year award to the couple, capping their more than 15 years of involvement with the organization. MacKenzie’s involvement with ProKids began when she joined the development team in 2002, eventually becoming the ProKids Development Director. One of the many highlights of her leadership on staff was the birth of the ProKids Friends of Children Breakfast in 2004. This single event, which continues today, has allowed ProKids to grow and reach a level of sustainability for years to come. Because of the Breakfast, ProKids now has almost 270 Friends of Children Society Members. As the Development Director, MacKenzie was a passionate advocate for the ProKids mission and turned that passion into direct action when she also became a CASA Volunteer in 2004; she directly served four children in her four years. 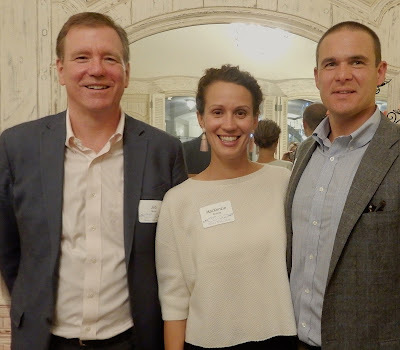 Since leaving the ProKids staff, MacKenzie has hosted events in her home to introduce others to ProKids, worked on fundraisers and numerous committees and, beginning in 2007, joined the ProKids Board of Trustees. MacKenzie’s passion for ProKids children has infected her entire family including her husband Manuel and her extended family. Their family-owned company, Parking Corporation of America, has supported ProKids. Among other partnerships, it has enabled the Superhero Run for Kids to have a home in one of their downtown parking lots as well. Manuel also has given his voice to ProKids. In 2016 and 2017, he delivered powerful speeches at the Friends of Children Breakfast, making a compelling case for the community to invest in the promise and future of our children. When you ask both of them about ProKids, however, it’s not about what they have done - it’s about what is left to do. According to the couple, it’s not just about the welfare of these children in the child protection system, it’s about our community as a whole. Manuel says community members like he and his family “need to go wide so the volunteers and staff can go deep and help these children." Since 1981, ProKids has advocated for abused and neglected children by mobilizing the Greater Cincinnati community to break the vicious cycle of child abuse and neglect. ProKids recruits, trains and supports community volunteers to serve as ProKids CASA Volunteers who speak up for these children and guide them into safe environments where they can thrive. With staff CASA Managers and attorneys, and through alliances within the child protection system, ProKids works to create a new cycle of growing up safe and secure. Learn more at www.prokids.org.